I’ve been spending a lot of time trying to clean up my craft room lately (starting with my craft desk and card catalog), getting it ready for a room tour sometime in the next few weeks, and there’s just so much to do! 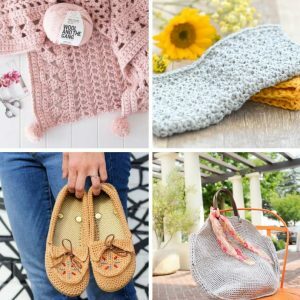 Still, when Tara from Suburble showed me a link for a cowl from Anthropologie, I knew I wanted to pick up a crochet hook…RIGHT NOW. Ok, if you haven’t figured it out, I’m not a fashion maven, so maybe a tri-colored scarf is no big deal for you, but it’s definitely outside my fashion comfort (read: boring) zone. 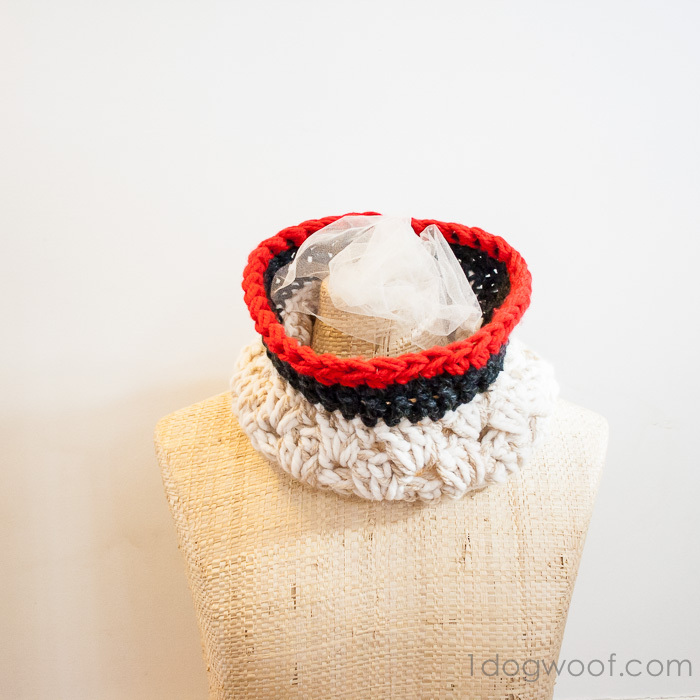 But I was weirdly intrigued by the not-so-intuitive combination of colors, so I decided to come up with my own chunky cowl crochet pattern and see if I’d actually wear it. For the beige/cream part, I crocheted using 1 strand of the Fisherman Thick and Quick and 1 strand of the Sandstorm together. 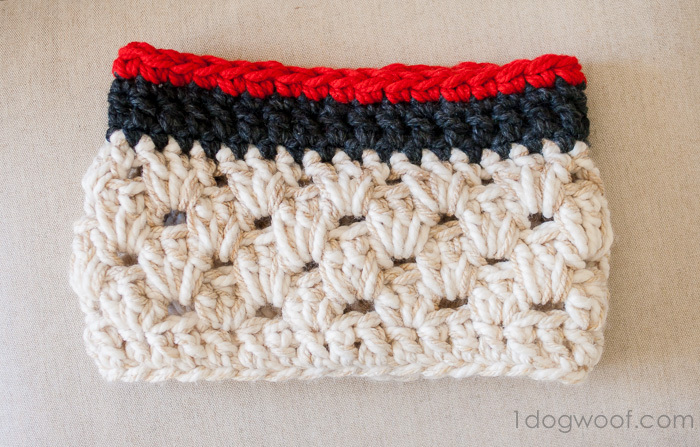 The dark section is using 1 strand of the Charcoal, and then the red trim is worked using 2 strands of the Cozy Wool to give it an extra thick look. I worked the beginning chain with a larger size hook to force the gauge to be looser. The rest of the piece is worked with the smaller hook. Just personal preference. For rows 3 through 5, the 3 double crochets are worked into the large stitch space, not just through the front and back loops. 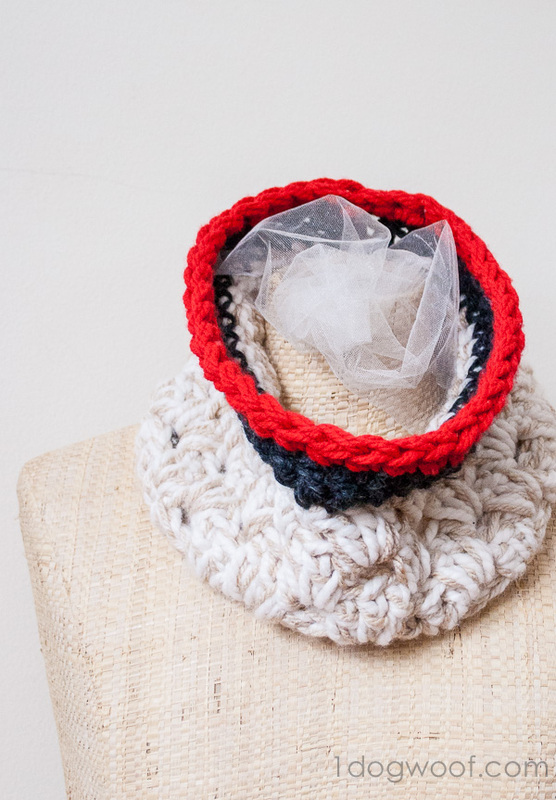 The 3 double crochets should be worked loosely into the piece to make a cozier feel. The instructions say to switch to the new color on the last slip stitch in the round, but feel free to use the seamless join method as well. Just make sure that there are always 36 stitches in each round. With 1 strand of color A and 1 strand of color B together, chain 36 using P hook. Without twisting the chain, slip stitch to the first chain. Switch to M hook. Round 1: Chain 2. DC in each stitch across. Slip stitch into first DC to join. Round 2: Chain 2. [Skip 2 stitches, 3 DC into next stitch] 11 times. Skip 2 stitches, 2 DC into next stitch. Slip stitch into first DC to join. Round 3-4: Chain 2. [Skip 2 stitches, 3 DC into next stitch space] 11 times. Skip 2 stitches, 2 DC into next stitch. Slip stitch into first DC to join. Round 5: Chain 2. [Skip 2 stitches, 3 DC into next stitch space] 11 times. Skip 2 stitches, 2 DC into next stitch. Change to color C on last slip stitch. Round 6: Chain 1. Work a SC in each stitch around. Slip stitch to join. Round 7: Chain 2. Work a DC in each stitch around. Slip stitch to first DC to join. Round 8: Chain 1. Work a SC in each stitch around. Change to two strands of color D on last slip stitch. Round 9: Chain 1. Work a SC in each stitch around. Slip stitch to join. Fasten off. So what do you think? Would you wear this color combination? Maybe with a black overcoat? Love it! I’ll make one once I get my yarn unpacked! Yes with a vest & jeans it would look great too. Love it! Especially the red pop. It looks so cozy! Thanks Steph! The inspiration cowl had pink in it, but I had no pink, so had to go with a different color. I like how the red turned out too! I love it and the colors are great. It looks good on you and does not look itchy like many of the store bought ones. Thanks Lisa! It isn’t itchy at all – just really soft and warm! I think you look gorgeous in it! Thanks for sharing the pattern with us! I hope you get over your cough real soon too. Blessings..
Well, you know that I love it! 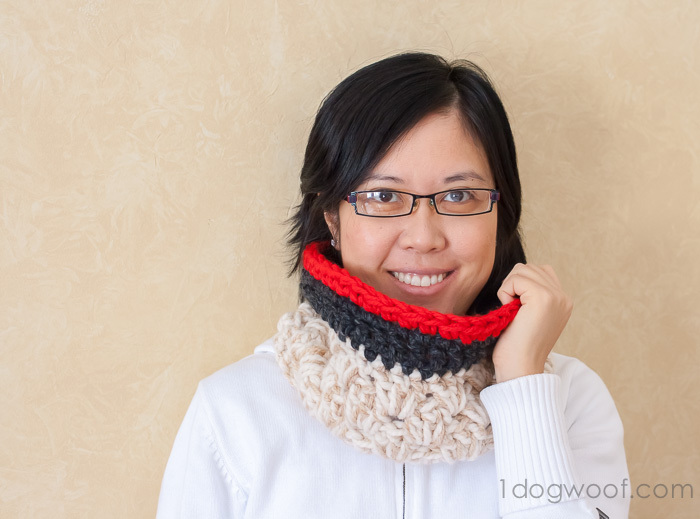 And I’m so impressed with how quickly you created this gorgeous cowl – you’re so talented, ChiWei! Pinned right this very second! I think it looks great on you & thanks for sharing your pattern! Hope you get better soon! Blessings.. Thanks for sharing! I have tried this and works up quickly:) I may increase the size a bit for my larger head but like the snugness of it! 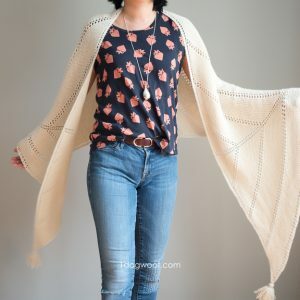 Great look and it looks easy to make for a beginner like myself.. Thanks Kelly! 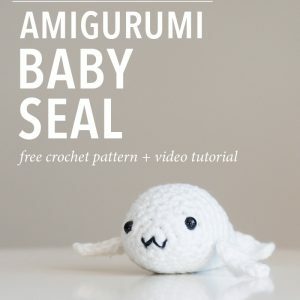 I think this would make a great project for a beginner – enjoy! I can’t tell from the photo, sorry!